Released bi-weekly, this report aims to identify broad trends in the cryptocurrency market. In order to reflect the latest developments in this fast-paced and volatile market, the reports plan to focus on metrics derived from a 30-day rolling window of data, this time from January 20, 2019 to February 18, 2019. Our universe of analysis includes 50 of some of the most widely used and traded cryptocurrencies, and groups them into sectors that reflect similar utility and valuation models. 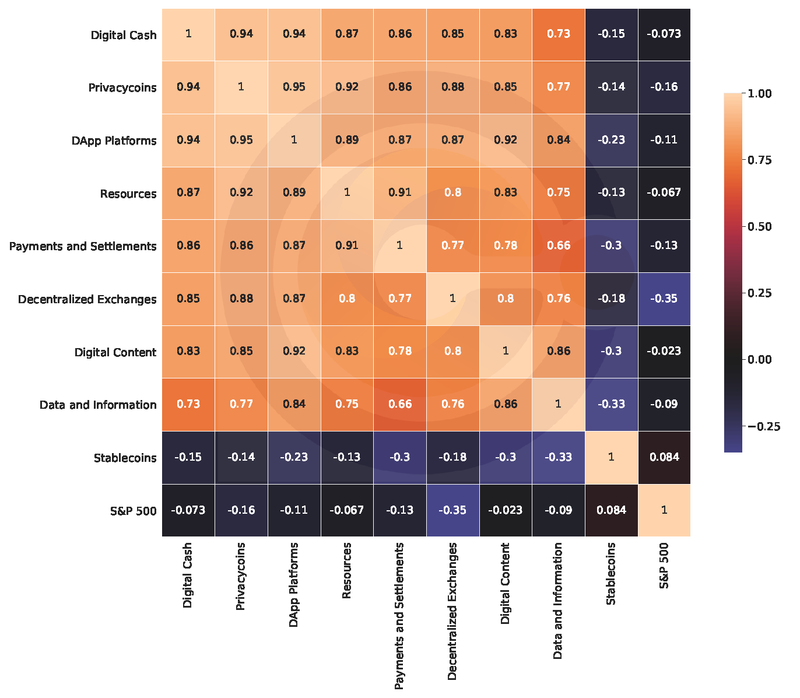 Through analysis of the recent historical performance of individual cryptocurrencies as well as their sectors, we provide a framework for analysis where investors can identify outperforming cryptocurrencies or sectors by comparing their performance relative to peers. Over the past month, 25 out of the 50 major cryptocurrencies that we examined are up from their values 30 days ago. Bitcoin (BTC), the largest cryptocurrency by market cap, recently broke out of the narrow range from $3,600 and $3,800 that it was confined to. It is currently trading around $3,950 at the time of writing. As is often the case, Bitcoin’s move upwards coincided with good news from other cryptocurrencies as well, with 44 out of the 50 cryptocurrencies having positive returns on February 18th. Outside of cryptocurrencies, the S&P 500 has been performing well, up 3.93% from 30 days ago and closing last Friday at $2,775.60. 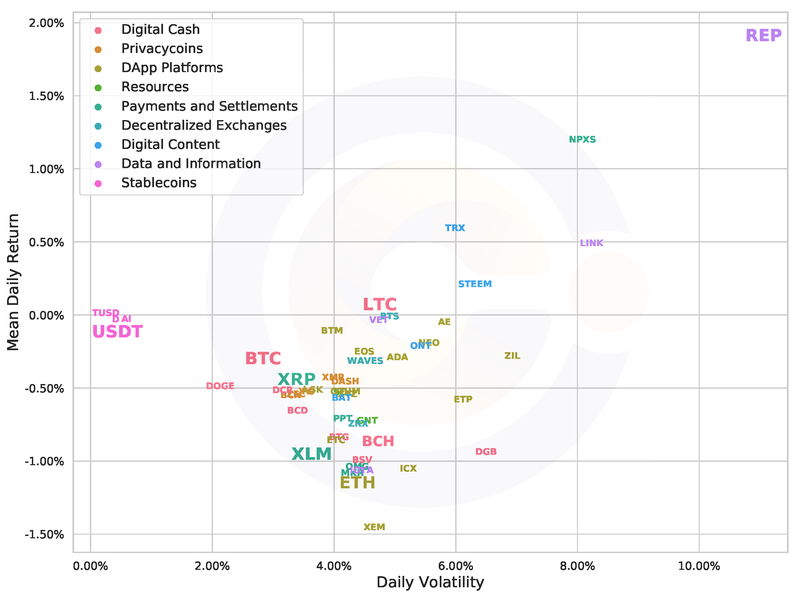 Figure 1 presents the risk versus return trade-off over the past 30 days by plotting mean daily return versus historical daily volatility for various cryptocurrencies. Figure 1. Plot of mean daily return against historical daily volatility for individual cryptocurrencies from January 20, 2019 to February 18, 2019. Higher returns at a given level of risk, measured through historical daily volatility, indicates a better investment. The best performer overall over the past month was Pundi X (NPXS), with a total return of 47.06%. The second and third best cryptocurrency was Litecoin (LTC) and EOS (EOS), with a total return of 42.79% and 23.01% respectively. Pundi X and Litecoin both performed relatively better than the similar cryptocurrencies that make up the rest of their sectors. Pundi X is a token used for payments and settlements, while Litecoin falls into the digital cash category. 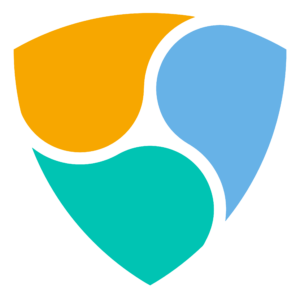 NEM (XEM) was the worst performing cryptocurrency, with total losses of 25.41%. Stellar Lumens (XLM) was the second worst performing cryptocurrency, with total losses of 22.56%. Figure 2 shows various performance measures of the nine sectors as well as that of the S&P 500 for comparison and Figure 3 plots the performance over time of each sector. Total returns ranged from -6.70% (data and information) to 6.76% (payments and settlements). 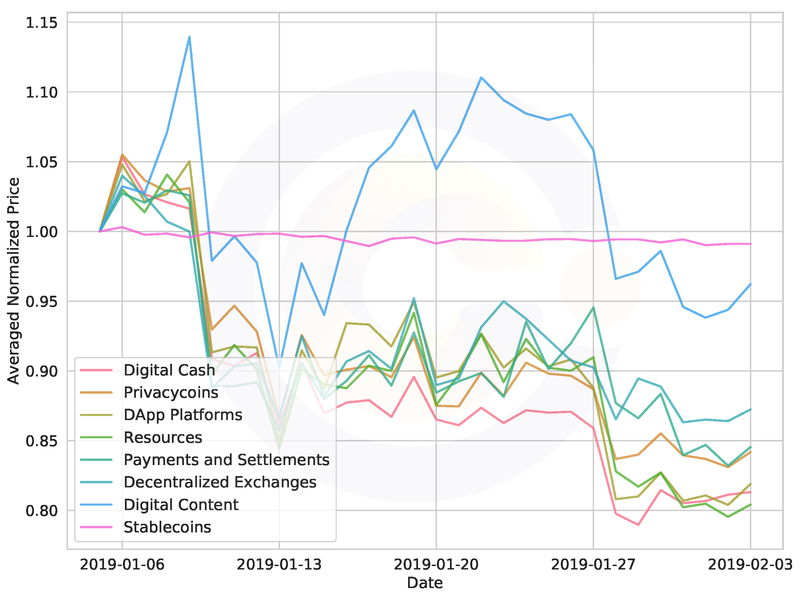 There was a dip in all sectors except for stablecoins around the end of January but all sectors have rebounded, making recoveries with varying degrees of success. Figure 2. 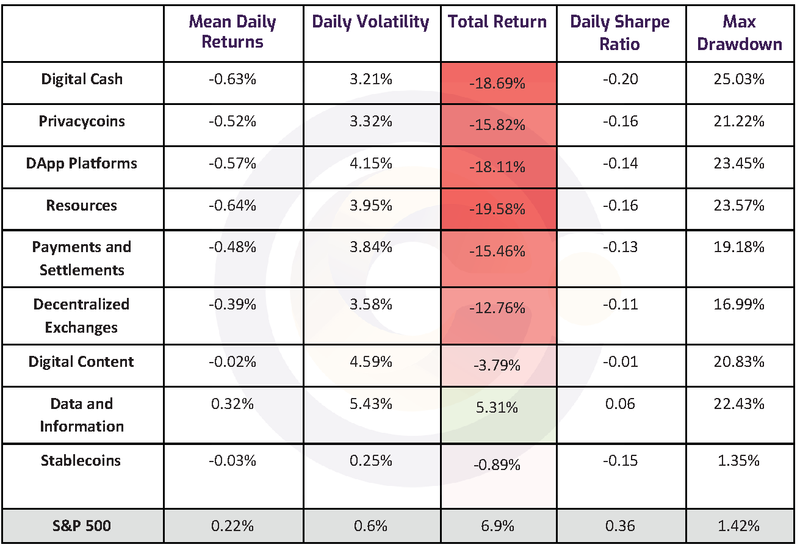 Mean daily returns, historical daily volatility, total returns, maximum drawdown, and ex-post Sharpe ratio for each sector from January 18, 2019 to February 20, 2019. Less negative maximum drawdowns and more positive Sharpe ratios are more desirable. The Sharpe ratio is calculated with the 10 year US Treasury bill rate as the annual risk-free rate. Figure 3a. Price performance over time by sectors that had positive returns between January 20, 2019 to February 18, 2019. Figure 3b. Price performance over time by sectors that had negative returns between January 20, 2019 to February 18, 2019. Figure 4 shows the correlation between the daily returns of each sector. As shown in Figure 2, stablecoins continued to fulfill their intended purpose well by maintaining low volatility, mean daily returns near 0%, and a near zero total return of -0.20% over the observation period. 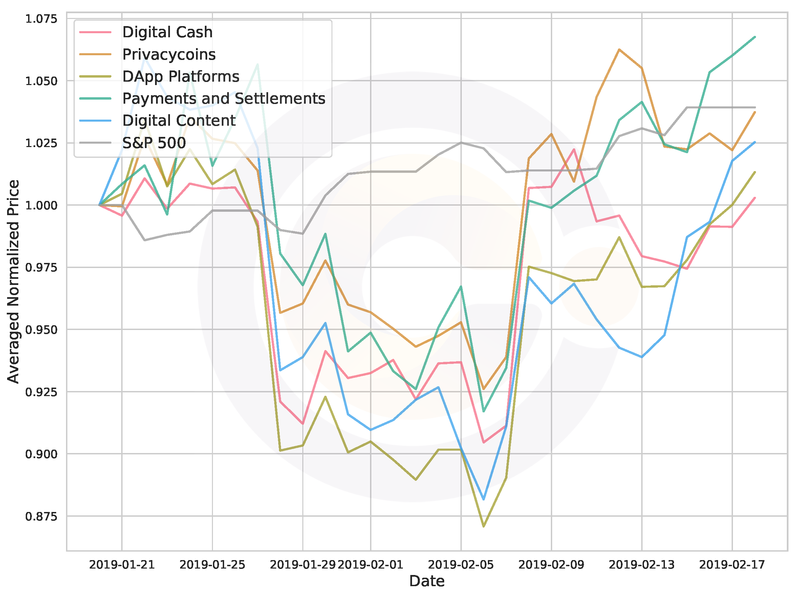 Stablecoins had moderate negative correlation with other sectors except for digital content, with which it had near zero correlation. As for the other sectors, they were less positively correlated with each other compared to the numbers we reported two weeks ago. Correlation ranged from 0.54 to 0.92, slightly lower compared to 0.66 to 0.95 previously. The S&P 500 also had near zero correlation with all cryptocurrency sectors. Figure 4. Correlation between daily returns of each sector from January 20, 2019 to February 18, 2019. Correlation ranges between -1 and 1. Correlation close to 1 indicates a more positive relationship between the pair of cryptocurrency returns and correlation close to -1 indicates a more negative linear relationship. Correlation close to 0 indicates no linear relationship. The daily price data of cryptocurrencies in USD at 4:00 PM EST from January 20, 2019 to February 18, 2019 was used for our calculations. To analyze performance by sector, the prices of constituent cryptocurrencies was normalized by dividing by the price on January 20, 2019, then averaged. When calculating the daily returns using this averaged normalized price, it is equivalent to if each sector was represented as an equally weighted portfolio of its constituent cryptocurrencies formed starting January 20, 2019 and the returns of the portfolio were calculated. Returns used throughout this report refer to simple returns. 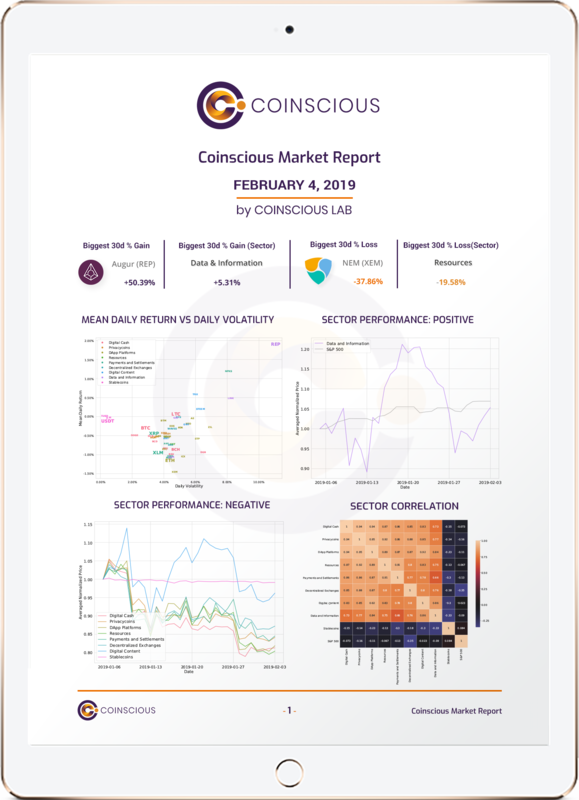 Released bi-weekly, this report aims to identify broad trends in the cryptocurrency market. In order to reflect the latest developments in this fast-paced and volatile market, the reports plan to focus on metrics derived from a 30-day rolling window of data, this time from January 5, 2019 to February 3, 2019. 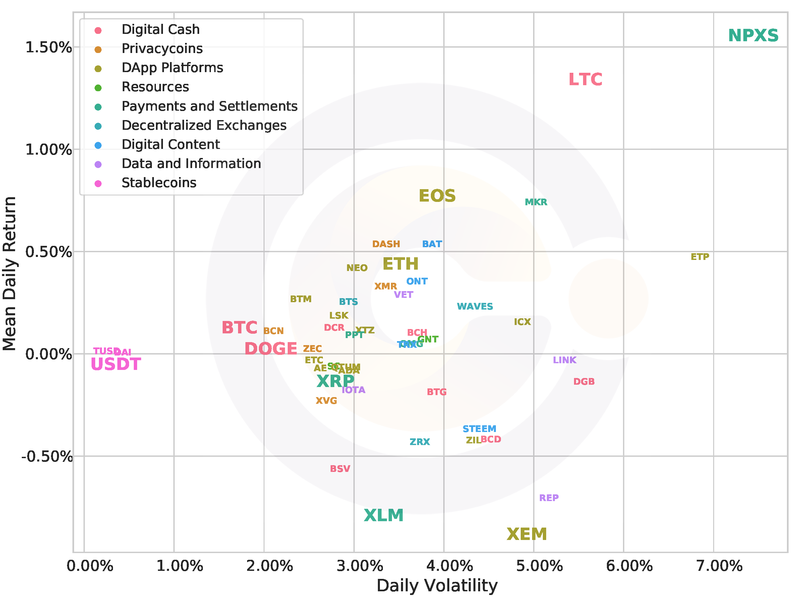 The performance of major cryptocurrencies over the past month has been lacklustre, with only 6 out of the 50 cryptocurrencies that we examined up from their values 30 days ago. Bitcoin (BTC), the largest cryptocurrency by market cap, has been trading between $3800 and $3400 without any major moves and is currently hovering around $3500. Outside of cryptocurrencies, the S&P 500 has been performing well, up 6.90% from 30 days ago and closing last Friday at $2706.53. Figure 1. Plot of mean daily return against historical daily volatility for individual cryptocurrencies from January 5, 2019 to February 3, 2019. Higher returns at a given level of risk, measured through historical daily volatility, indicates a better investment. The best performer overall over the past month was Augur’s reputation token (REP), with a total return of 50.39%. This was also the best performing cryptocurrency from our previous market report two weeks ago. The surge in price was attributed to the announcement of the Viel platform on January 15. 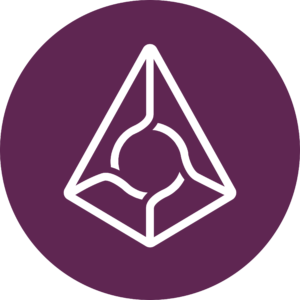 Viel is a peer-to-peer trading platform for prediction markets and derivatives built on top of Augur, with the goal of making Augur easier to use and more ubiquitous by making transactions faster and cheaper. NEM (XEM) was the worst performing cryptocurrency, with total losses of 33.31%. Ethereum (ETH) and ICON (ICX) were the second and third worst performers respectively, and all three are part of the dApp platform sector. Figure 2 shows various performance measures of the nine sectors as well as that of the S&P 500 for comparison and Figure 3 plots the performance over time of each sector. Performance between the sectors was mostly negative with only data and information having positive total returns. Total returns ranged from -19.58% (resources) to 5.31% (data and information). 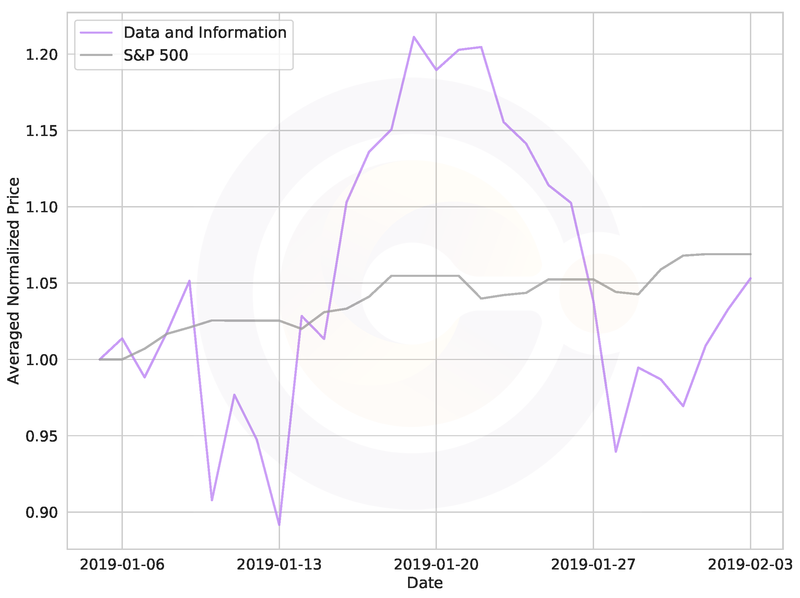 Data and information has been the best performing sector for three consecutive reports now, corresponding to a time period spanning two months. Reputation, the best performing cryptocurrency, is in the data and information sector, as well as ChainLink (LINK), IOTA (IOTA), and VeChain (VET). Resources, the worst performing sector, is composed of Siacoin (SC) and Golem (GNT). This is a sector for platforms and tokens that facilitate markets for decentralized resources. In the case of these two tokens, the resources are cloud storage and computing power respectively. Figure 2. 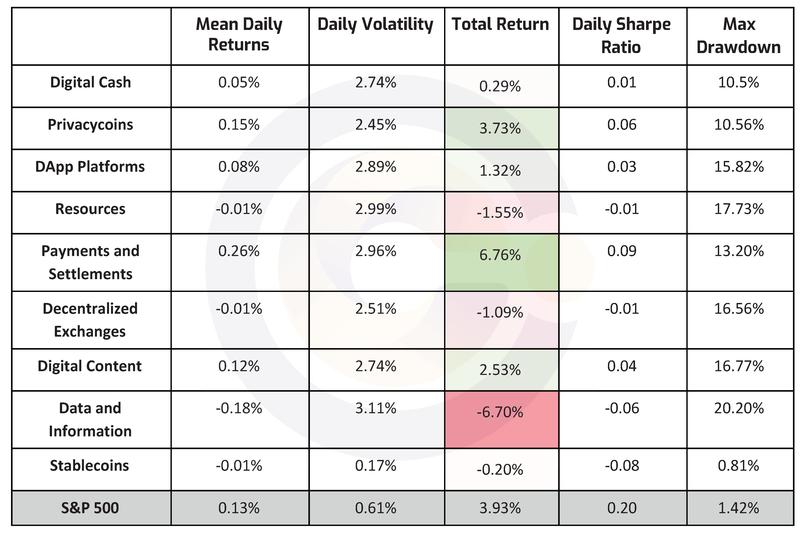 Mean daily returns, historical daily volatility, total returns, maximum drawdown, and ex-post Sharpe ratio for each sector from January 5, 2019 to February 3, 2019. Less negative maximum drawdowns and more positive Sharpe ratios are more desirable. The Sharpe ratio is calculated with the 10 year US Treasury bill rate as the annual risk-free rate. Figure 3a. Price performance over time by sectors that had positive returns between January 5, 2019 to February 3, 2019. Figure 3b. Price performance over time by sectors that had negative returns between January 5, 2019 to February 3, 2019. 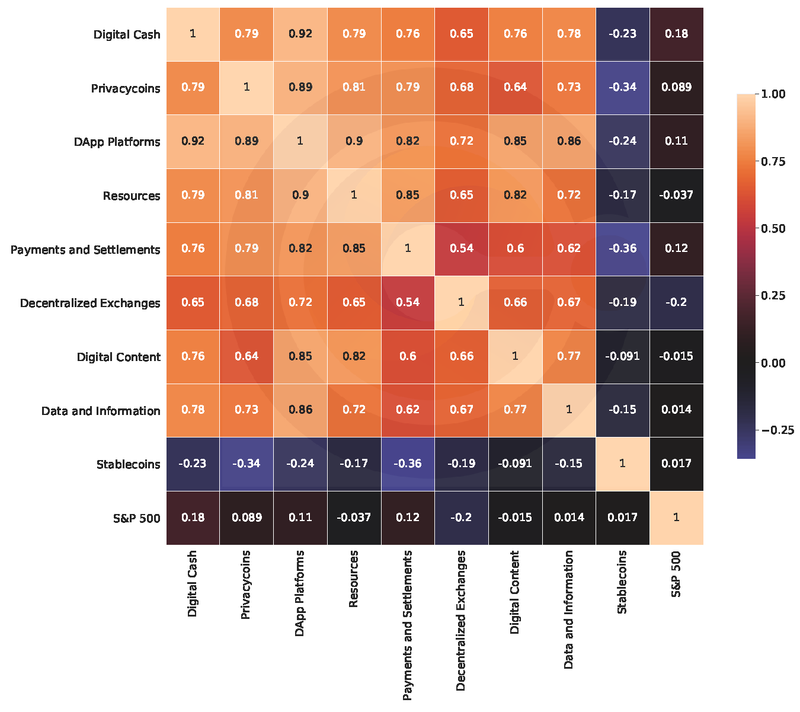 Figure 4 shows the correlation between the daily returns of each sector. Stablecoins had moderate negative correlation with other sectors. 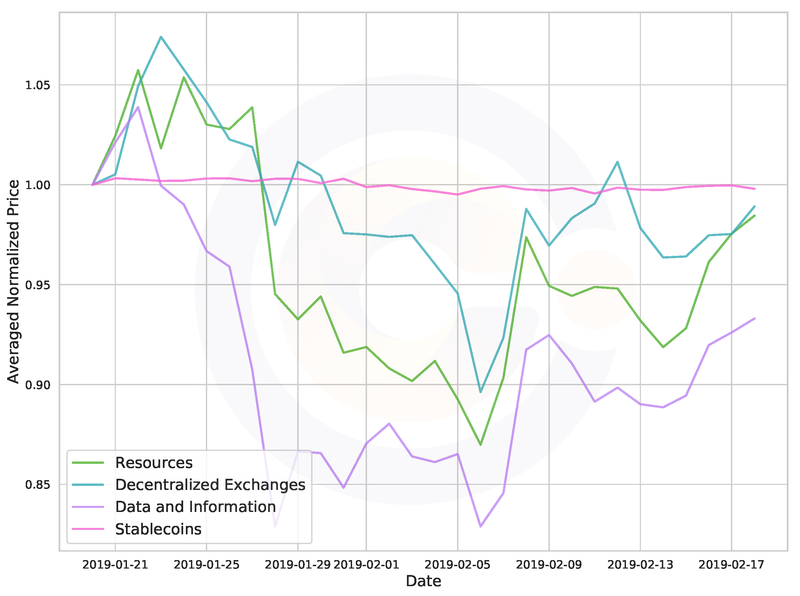 As shown in Figure 2, stablecoins continued to fulfill their intended purpose well by maintaining low volatility, mean daily returns near 0%, and a near zero total return of -0.89% over the observation period. The S&P 500 also had little correlation with any cryptocurrency sectors. As for the other sectors, despite their varying performance, they had high positive correlation with each other, ranging from 0.66 to 0.95, but slightly lower compared to 0.77 to 0.97 from two weeks ago. Figure 4. Correlation between daily returns of each sector from January 20, 2019 to February 3, 2019. Correlation ranges between -1 and 1. Correlation close to 1 indicates a more positive relationship between the pair of cryptocurrency returns and correlation close to -1 indicates a more negative linear relationship. Correlation close to 0 indicates no linear relationship. The daily price data of cryptocurrencies in USD at 4:00 PM EST from January 5, 2019 to February 3, 2019 was used for our calculations. To analyze performance by sector, the prices of constituent cryptocurrencies was normalized by dividing by the price on January 5, 2019, then averaged. When calculating the daily returns using this averaged normalized price, it is equivalent to if each sector was represented as an equally weighted portfolio of its constituent cryptocurrencies formed starting January 5, 2019 and the returns of the portfolio were calculated. Returns used throughout this report refer to simple returns.